With Game Update 2.8: Spoils of War right around the corner, the developers wanted to give you some more details about some of this update’s major features. We hope you are as excited as we are to reap rewards through Story Mode Operations, Galactic Starfighter, Warzones, and slot machines on Nar Shaddaa. My name is Chris Schmidt, Designer on Star Wars™: The Old Republic™, and I’m here to talk about the Nar Shaddaa Nightlife event coming with Game Update 2.8! On the Republic and Imperial fleets, you will notice some new floating advertisement terminals perhaps too enticing to ignore. When activated, you are a captive audience for the Star Cluster and Club Vertica Casino advertisements, inviting you to come and experience the Nar Shaddaa Nightlife for a limited time. 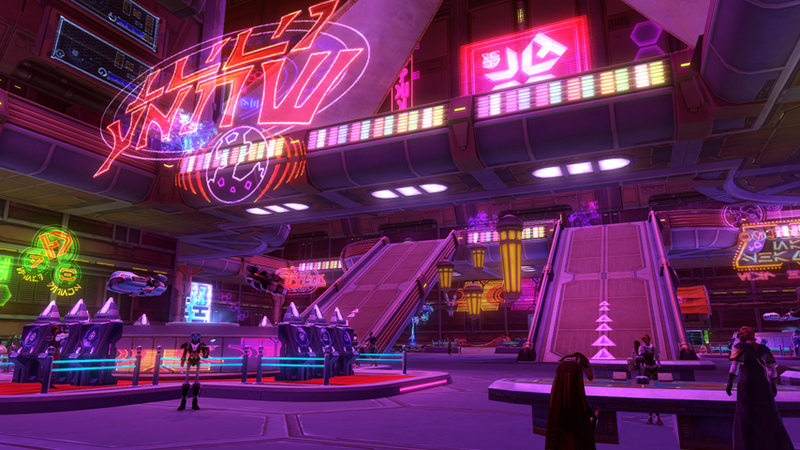 The heart of Nar Shaddaa Nightlife is the Smuggler’s Luck and Kingpin’s Bounty slot machines. Through these machines, players can win unique weapons, armor, cosmetic abilities, and mounts including an exclusive Rancor mount! Smuggler’s Luck machines consume Smuggler’s Casino Chips, which can be purchased with Warzone Commendations. Players using these machines have a chance of winning additional Smuggler’s Chips, Kingpin’s Chips, or Golden Certificates (more on these in a second). Additionally, the machine will sometimes grant you a Feeling Lucky buff, which increases your chances of winning on a Kingpin’s Bounty machine. Kingpin’s Bounty machines consume Kingpin’s Casino Chips, which can be purchased with Cartel Certificates. These machines award players with Kingpin’s Chips, Golden Certificates, or one of two exclusive mounts. Golden Certificates can be traded in to the Casino Cashier for weapons, armor, and toys. Show everyone your inner Kingpin with your new fedora, or equip the entire set of all-new weapons on your companions to form your entourage! One of the more fun aspects of Nar Shaddaa Nightlife to implement was bringing the casinos to life with ambient spawning, including the VIP area in the back of the Casinos. Here Giradda the Hutt and Baron Deathmark keep an eye on things while Beastmaster from Hutta would like to get his hands on the caged Rancor. With this event, we also introduce some new alien NPC’s to the game, including Aqualish, Snivvian, Ishi Tib, and Klatooinian models. I hope you all have as much fun participating in the event as we had making it, and I can’t wait to see you all on Nar Shaddaa! Good Luck! If you enjoy PvP, in either Galactic Starfighter or Warzones game modes, Game Update 2.8 is for you. Kicking things off with the Game Update 2.8 launch, all Galactic Starfighter matches will net you Double Fleet Requisition and Credits. Anyone can queue up right away and participate in a match to work towards upgrades to their current ship and help unlock new ships faster. The Galactic Starfighter portion of the event will last until Game Update 2.8.1 so be swift and absolute. Break out your Blackbolt and pick up your Pike, you've got Double Credits and Fleet Requisition to earn! During the race to the conclusion of Season 2 from 2.8.1 to 2.8.2 (Season 2 ends with 2.9) players who complete in any Warzone match will receive Double Commendations (Ranked or Warzone depending on the queue) and Credits. Brutalize your opponents in the Warzone queue with a heart pounding match in the Quesh Huttball Pit or take on a gang of 4 vicious opponents with your own team on Makeb Mesa Arena in the Ranked queue to earn more rewards and gear up faster. All while lining your pockets with the Spoils of War. Get in there and go berserk! On top of all that, two new ship variants, the Assault Bomber and Skirmisher Gunship, will be released for immediate purchase of Requisition. If you want to get these ships as fast as possible you can earn them faster quicker by participating in Spoils of War. Please note that these rewards do not include quests associated with Galactic Starfighter and Warzones. They only affect the rewards you gain at the end of the match. I wanted to take some time to talk to everyone about the changes we’ve made to Group Finder in Game Update 2.8, specifically for the Operations category, and what we are hoping to accomplish with these changes. The first change we’ve made is that Group Finder will now use the 16 person Story Mode difficulty for Operations. I’m sure anyone who has queued up as a DPS class has lamented the longer queue times for DPS classes versus healers and tanks. Since the tank requirements for 16 person are the same for 8 person, once the tank and healer requirements for an Operation are filled, firing the 16 person version will allow more DPS to participate in each Operation. The 16 person version also boasts greater rewards and has become the most popular Story Mode Operation setting, and this change will allow more people to participate conveniently through Group Finder. The second change we’re making is all players participating in an Operation through Group Finder will be Bolstered to an appropriate gear rating. We’re doing this for a couple of reasons. First, we want to be able to offer all the major Operation content through Group Finder, and since Dread Fortress and Dread Palace are a slight step up in difficulty compared to Scum and Villainy and Terror from Beyond we wanted to be sure that players felt like they have an equal chance of success regardless of what Operation they’re running. We also want to try to make Story Mode Operations feel more accessible, especially for players who have never participated in one before and may feel intimidated by the gear requirements. Hard and Nightmare Modes will not be bolstered, and will continue to be the place to go for players seeking challenge as well as the newest and most powerful gear. As I mentioned above, we want to include all of our major Operation content in Group Finder, and along with that we’re making some changes in how we present these new choices. Instead of a static group of Operations that then picks one at random, we’re introducing a rotating schedule. At any one time, one Operation per level bracket will be available to queue for. This Operation will change every few days, and you will be able to see how long is remaining for the current Operation and what Operation is next up in the Group Finder window. Our goal with this change is to allow equal access to all the Operations, and allow players to choose which Operation they want to queue for if they have a preference without a longer queue time and while still being eligible for the Group Finder reward. Speaking of rewards, we’ve increased the rewards for almost all of the Group Finder categories, so if you have wanted to try out group content in Star Wars: The Old Republic or if your Flashpoint achievement category is maxed out, queue up and make some new friends! Of course we will be monitoring the impact of these changes and will keep looking for ways to improve Group Finder. Hope to see everyone in an Operation come Game Update 2.8!